Call the Midwife’s producers Neal Street have partnered with The Historic Dockyard Chatham to create the official Call the Midwife Tour. Based on the memoirs of Jennifer Worth, this BBC drama series is set in the east End of 1950’s London and follows the lives of a group of nuns and midwives who face challenges working in a poverty-stricken area. The 90-minute tour takes you through various historic locations around the 400-year old Dockyard and includes a new permanent exhibition featuring props, costumes and sets rom the successful TV drama, now in its eight series. There’s a recreation of the Nonnatus House dining room set from Series 1, the dispensary room, costumes including Barbara’s wedding dress, a pram and, of course, a bicycle! Your costumed Tour guide will take you through the ‘streets of Poplar’ and reveal behind the scenes tricks including how the production team created snow in July and what they did with smelly fish on set! You will also get to see the ship which Sister Evangelina and Trixie had to climb aboard to help the Captain’s daughter give birth. Many Dockyard buildings stand in for London locations. For example, Admiral’s House stands in for The London Hospital using CGI to turn the coat of arms on the building into a clock. Steps and a doorway leading into the Victorian Ropery building are transformed into Poplar Police Station with the help of a lamp and noticeboard. 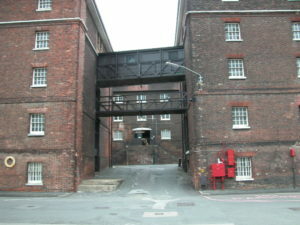 The Grade One Listed Old Yarn Mill is a popular location for the show and has featured on screen as the derelict building where Nurse Lee’s boyfriend Alec had a nasty fall. It was transformed into a Chinese laundry for one episode and even an East London Boxing Gym for another. The Tour concludes in the beautiful, secluded garden of Commissioner’s House and you can rest your weary feet on the bench where Helen George filmed the heart-breaking scene of Trixie breaking off her engagement before heading to the shop to check out the Call the Midwife merchandise available there. The Call the Midwife Tour ticket allows you access to all nine of The Dockyard’s galleries for the day and explore it’s three historic warships and the working Victorian Ropery that surround the “Poplar” streets. Tours are priced at £25 for adults and £21 for children. Call the Midwife returns with a new Christmas Special in December 2018 and Series 8 in 2019.